The Sound of the Tesla Semi Truck is Just What We Would Expect - Futuristic! A recent video of the Tesla Semi hauling a trailer gives us a glimpse of what to expect. Elon Musk, CEO of Tesla, once said that their electric semi-truck can be driven around like a sports truck. Considering that they come with high torque electric motors, this was to be expected. But the semi-truck speeding through the road is one impressive sight. Needless to the say, the specs were unbelievable for Tesla’s semi-truck. Without the trailer, this thing can go from 0-60 mph in just 5 seconds. With the added trailer, the 0-60 time is still impressive at 20 seconds with a load of 80,000 lbs. The vehicle is also very power efficient as it uses less than 2 kWh/mile. We have only stories of Tesla sightings; finally, we got a video! 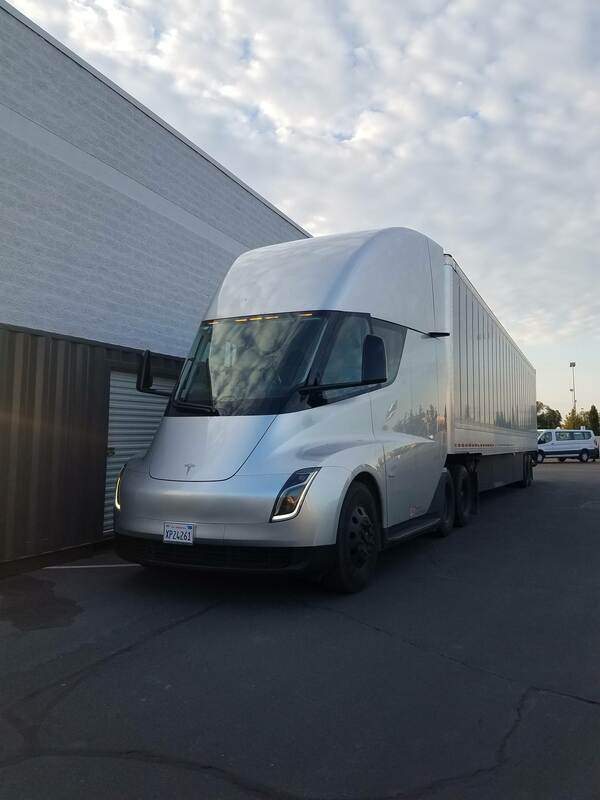 Recently, the Tesla Semi has been sighted at various spots in the US, pointing to the fact that Tesla has moved to the testing phase of their new offering. Since the truck has a production date of 2019, we can say that Tesla is on track for their new truck. According to a report by Electrek, who had been tracking the Tesla Semi, the vehicle can do 300 miles on a single charge. Tesla has two semi-truck versions in work – 300 mile and 500-mile range models cost about $150,000 and $180,000 respectively. Since Tesla has been working in secrecy, not to give the public too much info about the upcoming truck, there has only been sightings to reference their movement. However, a Reddit user u/m3gusta recorded a video of the truck moving past him with a trailer attached and it sounds amazing! We know that electric vehicles do not tend to have much sound, just a humming note. But since the semi-truck houses large motors, they make a more aggressive note. It is punchy and futuristic at the same time! More about the Tesla Semi, and upcoming trends! Tesla is planning to make add-on hardware for the semi-truck like sleeper cabin and carbon fiber body panels. The truck is slated to have 28 cameras on board so that the driver can have a clear view of their surroundings while backing up the vehicle or getting it through tight spots. The Tesla Semi also comes with Tesla’s autopilot technology. We can expect the vehicle to be stable as it has a low center of gravity, thanks to the battery pack that is placed close to the ground. The company will crank up the product by 2020 and they are now busy perfecting and testing the Semi across a wide range of use cases. The shift towards electric trucks is a welcoming change because it will result in a considerable dip in noise pollution. Since Tesla plans to make solar power Megachargers, which is touted to be able to charge a 500-mile battery to 80% in just 30 minutes, these vehicles can be recharged over renewable energy rather than fossil fuels. If the future is electric, Tesla is on top of the game!